Leading Restaurant furniture distributor helps Rochester, NY restaurant and bar upgrade with its seating needs by supplying it solid wood restaurant chairs made in the USA. Leading commercial furniture distributor, Restaurant Furniture Supply recently helped Eros Restaurant and Bar in Rochester, NY upgrade their seating by supplying them with American made, solid wood restaurant chairs. Eros Restaurant and Bar is a casual spot on the corner of Charlotte and Matthews streets, right around the block from 2 Vine and Spot Coffee. The cuisine is New American with a heavy Mediterranean influence. The building itself is a classic art-deco, international style single story structure. The interior is designed in a more modern motif with a large U-shaped bar dominating the center of the dining room. Fresh design touches abound from the peach ambient lighting recessed into the ceiling, or the material selection of the walls and bar. The menu is a mix of Mediterranean influence - with Italy and Greece providing the inspiration for many of the dishes. 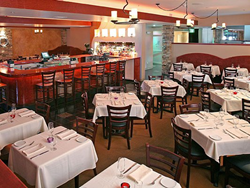 Signature entrees include Saganaki, Mousaka, spanakopita and Chicken Cutlet. The owner contacted to Restaurant Furniture Supply for new chairs because of their reputation for high quality at competitive prices", explained sales person Zach. "He decided to go with Restaurant Furniture Supply's Premium US Made Ladder Back Wood Chair in dark mahogany finish with padded vinyl seats in black". The Premium US Made Ladder Back Wood Chair sells for $79. A matching Premium US Made Ladder Back Wood Bar Stool is also available and sells for $92. Customers can choose from 6 different finishes or have a custom finish made for an additional charge. Customers also have the choice of a solid wood seat or an American made padded seat made of vinyl or other fabric which can be custom upholstered. As with most of Restaurant Furniture Supply's products, the Premium US Made Ladder Back Wood Chairs and bar stools are made in the USA from wood responsibly harvested in the Midwest. "It's a very popular chair with restaurant and bar owners. It is a classic and a favorite with restaurants across America. As a business that experiences heavy customer traffic, the owner knew he would need chairs and bar stools that would look great and would be durable and stand up to heavy usage" Zach remarked. "Also he liked that the chairs are made in the USA because this supports American jobs". Eros Restaurant and Bar is located at 37 Charlotte St., in Rochester, NY. They can be contacted at: (585) 546-2230.